Download our Culture Book eBook to discover how we live our values every day and gain helpful tips for improving your own Employee Value Proposition (EVP). Why do you prefer one brand of ice cream more than another? Does the entire experience – from purchase to that first spoonful – make you happy? Or more importantly, does this experience keep you connected and coming back for more? The same is true for why employees choose to work (and stay) at your organization — every “ingredient” makes a difference in how your company is perceived. Your Employee Value Proposition (EVP) in this case can be thought of as an ice cream sundae – one that's completely unique to your organization and helps you stand out amongst the other sundaes. While many choose to put a regular cherry on top, yours is as unique as the toppings on your own EVP sundae. Your EVP helps you understand what value you bring potential and current employees and what attracts people in the first place. Organizations that adopt creative ways to communicate their company values and culture truly stand out from the competition and create more connected, engaged companies as a result. In order to understand why people work at your organization, consider how you communicate your company culture from the start and carry it through the entire employee experience. Have you ever stopped to wonder how many of your employees really understand your company’s purpose? 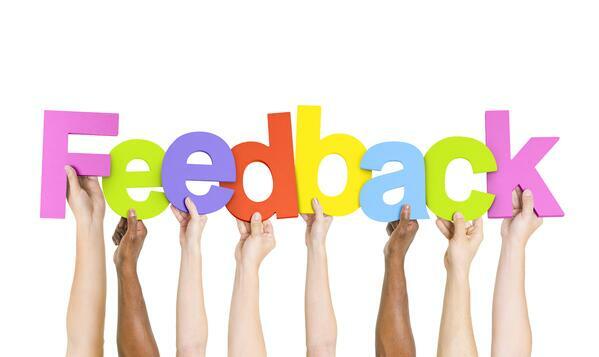 What about your corporate values, or how you’re promoting your company culture? Just like those flavors of ice cream, the answers can be different across the board. As a key promoter, though, it’s up to you to keep your message true to your organization. Whether you’re communicating to new starters or veterans, your message should be consistent, on-brand and reflect your company culture in a variety of ways. 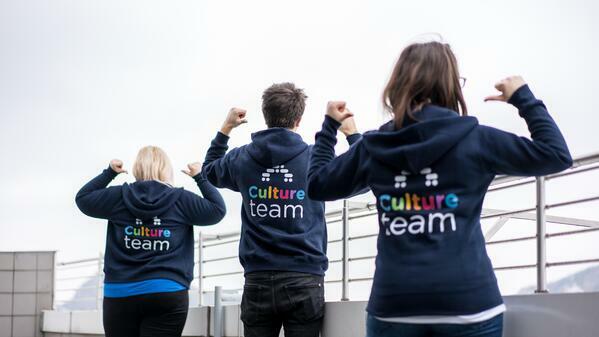 One way in particular to connect your team is with a culture book. It helps boost your EVP because it encompasses everything that makes your company unique and stand out as an attractive place to work. Put simply, culture books keep all employees aligned to the same mission and purpose. A company can showcase its values and let its people know that organizational expectations are universal across geographies or offices. If your EVP is your competitive advantage, your Culture Book is the tool to promote it. Culture books are tailored to your people and offer an insider glimpse that captures what it’s like to be a part of your organization day-to-day. Keep in mind there’s no such thing as perfect and your culture book will go through changes as your company does. As I type, we’ve just put the finishing touches on our new Culture Book here at RG! We held focus groups in every office, led by a member of the Culture Team to get input on what was working, what wasn’t and also how they felt about the design. We found that while our pocket-sized book was great, we re-oriented it to fit more on the pages and create something easier to flip through. Our values stayed intact, but we added in anecdotes from our people to showcase real-life examples of how we live our values day-to-day. We highlighted some of our top perks and benefits, such as our satellite offices as we have many remote employees that enjoy flexible working, and our comprehensive recognition program that was rolled out less than a year ago. 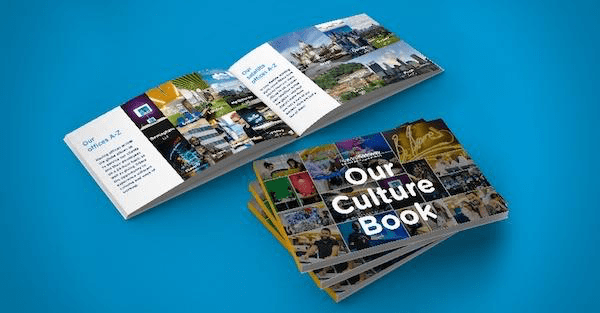 We wanted everyone to feel connected to the Culture Book in some way, whether that was through a focus group, one-off commentary via Slack or noting wider trends such as what benefits were the most popular among our staff. Our Culture Book is a reflection of our inclusive and diverse workforce, and pinpoints the essential values that guide us every day. By showcasing images of RG people, paired with our on-brand colors and tone of voice, the design team was able to balance our brand and demonstrate our culture in an innovative way. Our star designer Leonie worked to bring every page of the book to life through photos that capture what it’s really like to be a part of the RG family. We also tied our redesigned Culture Book to our Engagement Bridge™, which includes the 10 elements of engagement and is a model we reference daily. One of the best parts about redesigning culture books is the ability to look back at previous versions to see how we’ve grown as an organization. Our Culture Book continues to be one of the most important documents at RG. During the recruiting process, candidates are introduced to our culture very early on. I give each interviewee a copy of the Culture Book to take with them and read through at home. This not only gives them a chance to get familiar with the content, but also to help them determine if the culture is the right fit for them in the interview process. 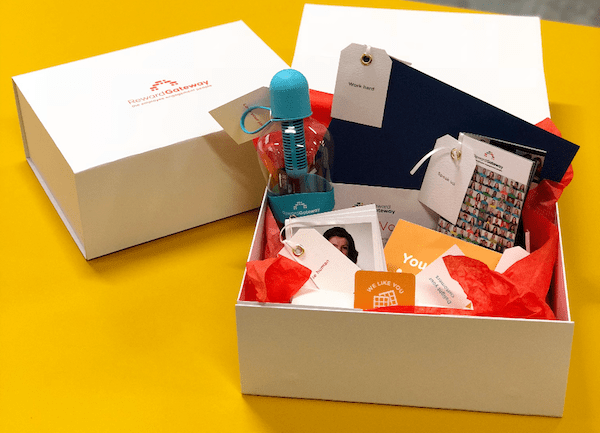 Additionally, when a new starter joins Reward Gateway, they receive a welcome pack which is full of values-based swag and of course a Culture Book. We carry the Culture Book conversation into onboarding. These new hires attend a Culture Book meeting, where they go through the information page-by-page. It’s important that when new employees join our company, they understand how impactful the Culture Book is, but more so how connected to our company culture we want them to feel. My biggest piece of advice is: Do not underestimate the power of your company values. When employees feel connected to your purpose and direction the company is going, they’re engaged and involved. But when they’ve got this information at their fingertips, in the form of a culture book, you’re helping to grow their connections and commitment, but also help extend your EVP. 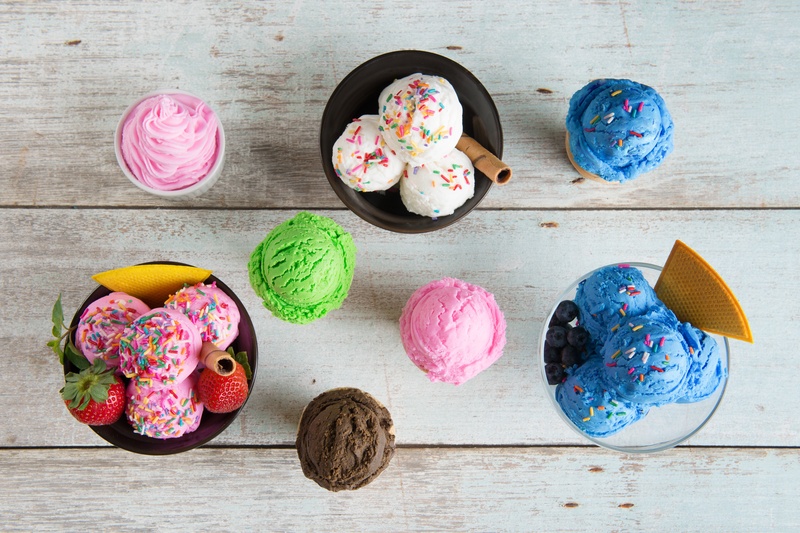 Ask yourself, "what makes my organization's ice cream sundae stand out from the crowd?" Didi Korova is the Head of Learning & People Experience at Reward Gateway.